Where Landscaping and Hardscaping Come Together! 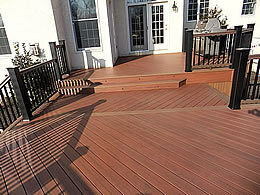 Paverscape Inc. has teamed up with JR Freed Decks! Whether you want a beautiful place to rest and relax with family, a special place to entertain friends and neighbors, or both, Paverscape and JR Freed can transform your back yard into the outdoor living space of your dreams! Like us, the guys at J.R. Freed Construction are very talented, use only the best materials, and are all about customer satisfaction. It was only natural that we teamed up with them. One contract, one seamless design. Why get multiple contractors or sub-contractors involved with the additional costs, scheduling issues, and delays? One contract can now cover your patio, deck, walkways, pavilion, awnings, ponds, landscaping, and more. Best yet, all the work will be done by a name you trust. 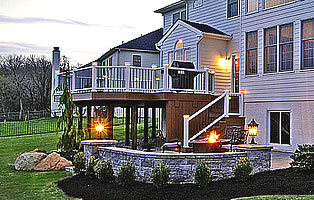 Below are some custom deck and patio combinations designed and built by Paverscape Inc. and JR Freed Construction. Click on any image to see a larger version and additional project images. There is plenty of patio and deck space with access from each rear doors of the house. This project includes a cozy patio with a Techno-Bloc fireplace we modified to install a gas burner. The three distinct portions of the project flow seamlessly together to create the fabulous space. Custom paver patio and deck combination with "kit trellis"
Techo Block Patio with Timbertech Deck surrounded by Fortress Iron railing. 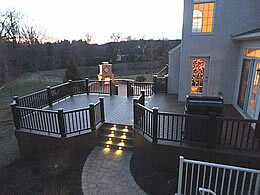 Techo Block Patio and Fireplace with Timbertech Deck, Railing and Koi pond. 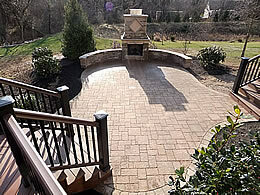 Paver Patio with Ipe Deck and railing. Get your project started today ! !